With some prep work the day before, it was just some fun assembly first thing in the morning to get the Bostock ready for the oven. I used thick-sliced (not quite an inch, closer to 3/4 inch thick) Japanese milk, or hokkaido, bread. When I visit the Japanese market, I like to pick up some of this bread; it's super fluffy and sweet. Like with French toast, you want to use day-old bread, bread that's a bit dry so it soaks up the simple syrup without breaking down. Speaking of simple syrup, this one is made with vanilla bean. I've seen recipes using orange simple syrup and that sounds quite tasty, too! And instead of apricot jam, I'm sure you could use another if you prefer. Apricot preserves/jam happens to be one of our favorites (think Italian tri-color cookies) so I'm happy to use it. You certainly don't have to do this but I slightly heated and strained my apricot preserves because my son and I don't like a lot of chunks (my husband isn't picky like we are). To assemble, start by brushing the bread on both sides with some vanilla-bread syrup; it's beautiful to see those black specks on top of the bread after you do this. Then, spread about a tablespoon of jam on top on the bread before slathering 2-3 tablespoons of frangipane over it. Scatter some almond slices on top to accentuate the almond theme and give the pastry a little more crunch, and they are ready for the oven. In the 10-15 minutes it takes to bake, get the coffee or tea going! Here they are right out of the oven. It's hard to tell if they'll be good at this moment from looking at it. The proof is in the pudding, or tasting, so I quickly finished by dusting them with powdered sugar and racing them to the table for family breakfast and the tasting that I've been eagerly anticipating. Surprise, surprise...they taste so good! There's such a great texture and so much flavor going on, you don't need anything to go with it. As my family and I ate and talked, the edges stayed nice and crunchy, and with each bite, I kept exclaiming how much I loved it! I am a true almond pastry fanatic and this was worth the effort. I want to eat this again very soon...and I'm going to keep a closer eye out for Bostock when I stop by pastry shops. I don't recall ever seeing it but now that I know to look for it, I'll be sure to grab it when I do! Make simple syrup: In a small saucepan, combine the water, sugar, and vanilla bean seeds. Cook over medium-high heat until sugar dissolves, about 2 minutes. Set aside to let cool. 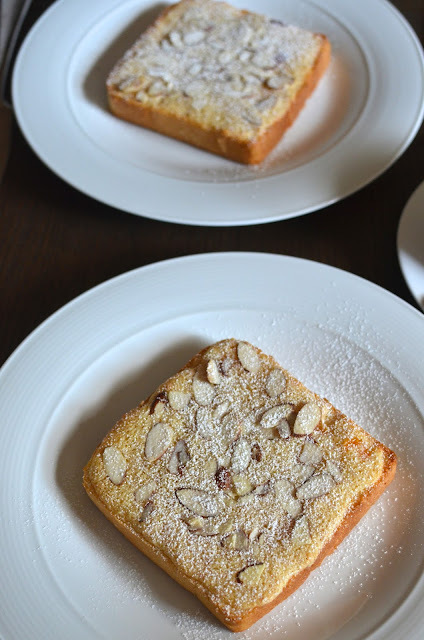 Make frangipane: In the bowl of a food processor, add almonds and sugar; process until fine. Add butter, egg, flour, rum, salt, and almond extract. Process until frangipane is smooth. Transfer to a bowl and set aside. Assemble the Bostock: Preheat oven to 400 degrees. Line 2 baking sheets with parchment paper or silicon baking mats. Begin by brushing both sides of the bread slices with the simple syrup and placing them on the prepared baking sheets. Spread each top evenly with 1 tablespoon of apricot jam, then top each with about 3 tablespoons frangipane. Sprinkle the top of each with sliced almonds. Bake until golden brown, about 13-15 minutes. Remove from the oven, sprinkle with a dusting of confectioners' sugar, then plate and serve! I want one! I have never had this before but I can tell just from your list of ingredients this has to be super delicious. I see you have the kettle already going, I will be right over! I have never heard of bostock before but now I definitely want to try this! I mean, what's not to love??? Anything with almonds I just love love love!! I've kind of seen it once or twice but this time, I really paid attention...and made it! Yum! Never heard of this bostock, but I know I would love this. Thanks for sharing! It's such a treat, Cheri. Thanks. Oh my goodness! You KNOW I will love this and I've never even heard of it! You posted this for me - I know you did - haha. Love that almond flavor and I can taste these now. Absolutely amazing! My mind is spinning with ideas - thanks for the fantastic inspiration. Absolutely, Tricia!! Totally posted it for you! : ) I knew you'd appreciate it as a fellow almond pastry lover! haha. I hope you try it one day. I can't imagine you not liking it, especially when you put your own touch on it. They look like biscuits :-)) I have never had a bostock, but I can tell from the pictures and ingredients that these are heavenly! Heavenly is a great way to put it! I've never heard of bostock before but I really want a few right now! I love all the almonds in here! Looks so delicious! Thanks; I'm glad I made it. I've never seen anything like this, they really look delicious! I would love some. It was very delicious - I hope you eat some one day! Hope you get a chance to try it. We loved it! I must be living under a rock because I have never heard of bostock before. Looks amazing! I've never heard of this before, but it looks and sounds amazing! Always something good to try, I think! 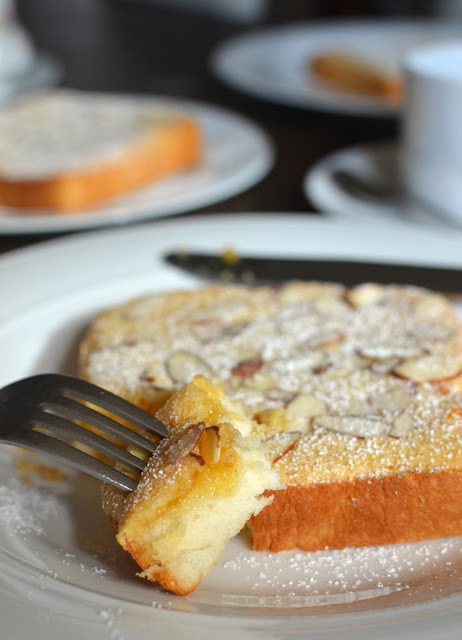 You won't regret giving it a try if you like almond pastries! I was in a rush to taste, too! haha. I tried to click the photos as fast as I could and didn't matter if they didn't come out well. I am a big fan of all almond pastries so this was right up my alley and tasted better than I anticipated.